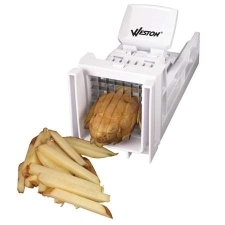 Home french fry cutter makes cutting restaurant style french fries quick and easy. Features a ratching handle that advances potatoes through blades. Use the removable knife guide to dice and cube potatoes for your favorite hashbrowns or potato salads. Dishwasher safe.